Oahu may be the busiest and most populated Hawaiian island, but that doesn’t mean there aren’t some great hiking trails to get away from the bustle. I’ve spent several months exploring Hawaii over the years, and especially Oahu, but there are so many amazing things to see here I almost lose track. 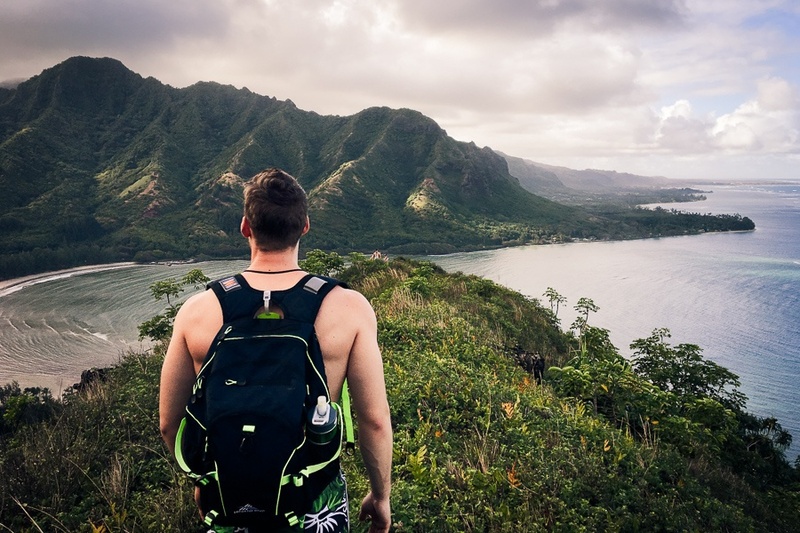 Here are 10 of the best hikes to do on Oahu! This hike is epic, dangerous, and illegal. Still interested? The ‘Stairway to Heaven’ takes you to the top of the Ko’olau mountains via 3,922 metal stairs of pure adrenaline and doom. At some points, the stairway is almost vertical, clinging to the side of the steep mountain. There’s an old World War II radio station at the top of the mountain, but the stairway has been closed since the 1980s, and fines of up to $1,000 have been given out to people caught climbing it. The area is even patrolled by security guards around the clock. I first discovered this hike on the internet in 2015 and knew I had to try it. Not only were the views out of this world, but the whole experience was just indescribably awesome and unique. Even after traveling in dozens of countries now, this is still my favorite hike in the world. It may never be topped! This is a little island located on the windward side of Oahu. The best way to reach the island is by kayak, but you can also wade to it when the tide is low. The hike to the top of the ‘hat’ is a good, rocky scramble and you’re rewarded with some amazing views of the Ko’olau mountain range! This is a short but epic hike that ends with a panoramic view of the mountains and jungle at Kahana Bay. You can stop at this hill, or keep going up the mountain and this trail will eventually merge with Puu Manamana, one of the scariest and most dangerous cliff trails in Hawaii. This is one of the most popular hikes in Hawaii, and it’s also one of my favorites. It’s a short hike to a couple of World War II-era concrete bunkers near Lanikai Beach. The 360 degree views that you get on top of the bunkers are amazing, and make this one of the best sunrise and sunset spots on the whole island. This is a paved hike with railings most of the way, and it takes you to the top of the old Diamond Head volcano crater. From the top, you can look out over Waikiki and the whole Honolulu cityscape. This trail can be pretty busy with tourists sometimes, but I still think it’s worthwhile for the city views. This is a ridge hike that takes you to some small World War II bunkers on the west side of Oahu, including a pink painted bunker at the top of the ridge. You can walk inside any of these concrete bunkers or climb on top of them, and you get some great views of the Waianae neighborhoods in the distance. This hike takes you to the western tip of the island. It’s a 5 mile round trip hike, but the trail is flat all the way to Ka’Ena Point. This is a pretty secluded part of the island, so it’s a great place to see seals, whales, and other wildlife! In one hike, I counted 5 monk seals lounging on the rocks at Ka’Ena Point. This is a short pillbox hike that gives you views of Kaneohe Bay and the entire windward side of Oahu island. You can sit and watch the U.S. Marine Corps planes flying in and out of the base at MCBH. The other bonus is that it’s a barely known hike, so it’s never crowded! The short but steep hike to Upper Makua Cave is not recommended if you have a fear of heights. This one is a guaranteed adrenaline rush. It’s a hidden gem on the west side of the island, and there were only a couple of other people on the trail when I went. The view from inside the cave looks like a picture frame of the west coast! The hike to the top of this old volcano crater is a huge workout, hence the nickname ‘Stairs of Doom’. I hated this hike the first time I did it, but now I’m addicted to it. The good news is that this is one of the best places to watch the sunset on the whole island of Oahu! I’ve climbed Koko Head a grand total of 7 times now, and the sunset view at the top never gets old.